The U.S. Department of Health and Human Services (HHS) announced $884,908 in Quality Improvement grant awards to 14 health centers in Hawaii. Funded by the Health Resources and Services Administration (HRSA), Hawaii health centers will use these funds to continue to improve quality, efficiency, and the effectiveness of healthcare delivery in the communities they serve. This announcement comes during National Health Center Week, the annual celebration that highlights the critical role community health centers play in providing high-quality, affordable, primary healthcare. “Community health centers provide coordinated, comprehensive, and patient-centered care to millions of Americans,” said HHS Deputy Secretary Eric Hargan. “They have a track record of delivering quality care at significantly lower cost, and are vital partners in our movement toward a health system that delivers quality, affordable, value-based health care for all Americans.” HRSA’s Quality Improvement grant awards promote continued community health center improvements in the following categories: Expanding access to comprehensive care, improving care quality and outcomes, increasing comprehensive care delivery in a cost-effective way, addressing health disparities, advancing the use of health information technology, and delivering patient-centered care. Community health centers that exceed national clinical quality benchmarks, like Healthy People 2020 goals, receive special designation as National Quality Leaders. The top 30 percent of community health centers that achieve the best overall clinical performance receive designation as Health Center Quality Leaders. In Hawaii, four health centers were designated as health center quality leaders. “Quality, value-based care is a priority of the U.S. Department of Health and Human Services and HRSA-funded health centers serve as leaders in quality healthcare in the U.S.,” said HRSA Administrator George Sigounas, MS, Ph.D.
“Nearly all HRSA-funded health centers demonstrated improvement in one or more clinical quality measures from the year prior, and these funds will support health centers’ work to improve the quality of care they deliver every day in their communities around the country.” HRSA also released new data compiled from health centers through its Uniform Data System (UDS) reporting, providing an update on health centers’ provision of primary healthcare services. In 2017, more than 27 million people (approximately 1 in 12 U.S. residents) relied on a HRSA-supported health center for affordable, accessible primary healthcare including: x One in nine children 17 years or younger; x One in five rural residents; x One in three people living in poverty; and x More than 355,000 U.S. veterans. For more than 50 years, health centers have delivered affordable, accessible, quality, and costeffective primary healthcare services to patients. Today, nearly 1,400 health centers operate more than 11,000 service delivery sites nationwide. To learn more about HRSA’s Health Center Program, visit: http://bphc.hrsa.gov/about. To locate a HRSA-funded health center, visit: http://findahealthcenter.hrsa.gov. We're proud of the incredible work done by the fourteen Community Health Centers across Hawaii, humbled by the recognition from Governor David Ige on the importance of our members and the work they do and, most of all, excited for COMMUNITY HEALTH CENTER WEEK 2017! Visit your health center website for more details on the amazing activities planned for next week. Although this has been a challenging year, we look back with deep gratitude for the many partners we've had in our ongoing efforts to create a thriving, healthier Hawai‘i. We also look forward with great determination to continue the very important work of providing access to quality health care to all, and are excited to share new and exciting initiatives in the year to come. As always, we remain hopeful thanks to you and your steadfast commitment to the values we all share. As we do every year, the staff and members of the Hawai‘i Primary Care Association share our warmest mahalo for all that you do, and wish you and your family a very happy holiday season. First of its kind mobile care vehicle debuts in East Hawaii as part of Bay Clinic's commitment to increasing access to care on the Big Island. Funded in part by a variety of grants, the fully operational mobile will provide medical and dental services to remote areas of the Big Island including Volcano, Pauoa, Mountain View and Ocean View and is part of Bay Clinic, Inc. CEO Harold Wallace's plan to improve access for East Hawaii residents. The $580,000 mobile unit, the first dual-use primary medical and dental vehicle in the state of Hawaii, was blessed earlier this week. In addition to delivering much-needed services to these communities, health center staff will be gathering data to determine where and how to expand services to the places they're most needed. Blessing ceremony for Hawaii's first dual-use medical and dental mobile health unit. 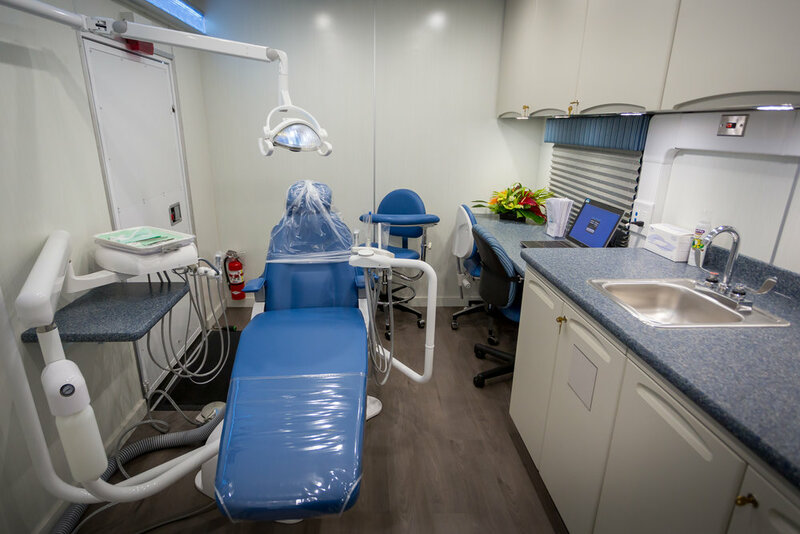 Dental operatory inside the Bay Clinic Mobile Health Unit. Medical exam room inside the Bay Clinic Mobile Health Unit. This time of year – election season – is not one we typically associate with consensus or collaboration, even more so when the subject is health care. However, if there is one area of our social policy where there is broad-based bipartisan agreement, it’s the essential role of Community Health Centers, which serve as the medical home for nearly 150,000 patients across our state. For almost fifty years, Hawai‘i’s Community Health Centers have been tireless advocates for a comprehensive, integrated approach to health care; one which recognizes that the social origins of health – where a person lives, what kind of education they receive, how they access social support – create lasting effects on the sustainability of our communities. Often, it’s Hawai‘i’s poorest, most vulnerable communities where these social factors hit hardest, devastating the health and well-being of many, including the elderly and our keiki. Our patients are treated with compassion, a respect for their culture and beliefs, and an expectation that they will be active and engaged partners in their own health. This integrated and holistic approach is how Community Health Centers consistently deliver high quality care that actually saves the health care system in Hawai‘i millions of dollars, reducing unnecessary hospitalizations while improving the health of patients with costly, chronic disease conditions like diabetes, hypertension, and obesity. That’s one reason local, state, and federal leaders will be visiting local health centers as we celebrate National Health Center Week. It’s an opportunity to recognize the innovative solutions and partnerships we’ve developed to heal our communities and we invite you to join us at events across the state from August 7th to the 13th: NHCW in Hawaii. For decades, Hawai‘i’s Community Health Centers, and the Hawai‘i Primary Care Association, have been champions for issues which don’t necessarily make for bold headlines but, instead, have the very real potential to save lives and save money. In the years ahead we will continue seeing any patient, regardless of their ability to pay, and offer the highest quality, most effective level of primary care in the state. And, most important, we will continue to seek visionary partners who will work with us to introduce cost-effective, innovative, and compassionate ways to modernize and revolutionize the delivery of care so that all of Hawai‘i’s communities are healthy, thriving, and sustainable.